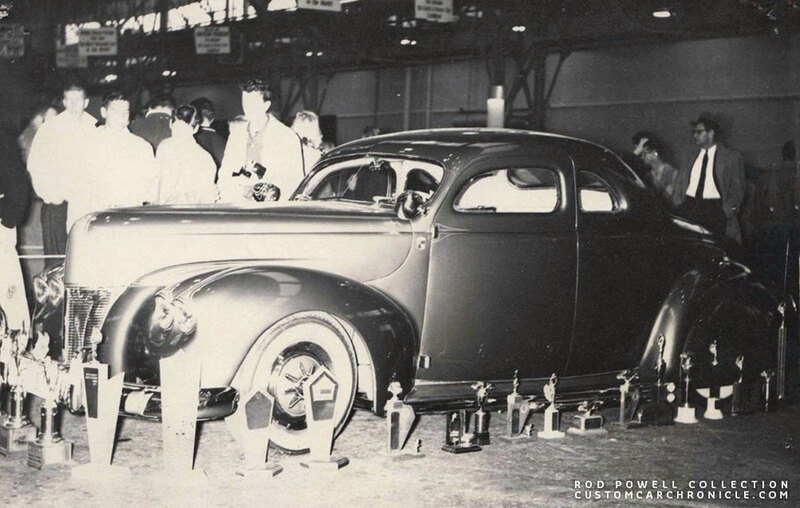 Tom Hocker’s Barris Kustoms built 1940 Ford Coupe has been around since the early 1950’s. It has been updated a few times, but now its getting close to beeing restored back to its 1957 Barris Version. 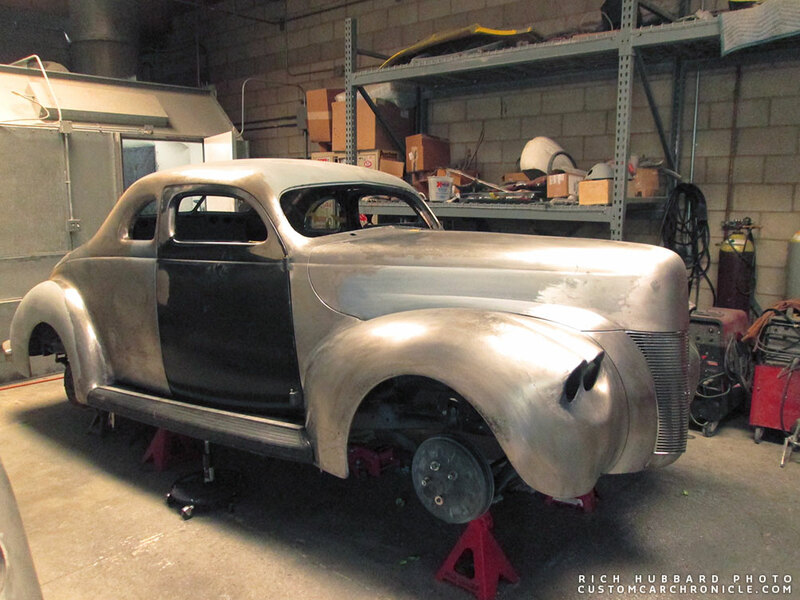 Tom Hocker from Oakland, California took his 1940 Ford coupe to the Barris Kustoms shop for a full restyling. 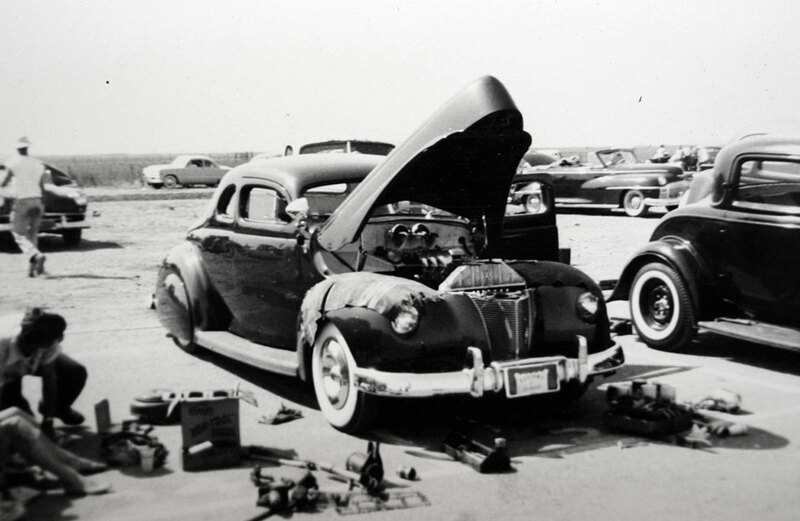 In the early 1950’s the Barris shop chopped the top 2-3/4 inches in the front and 3-1/2 inch at the rear. The windshield was leaned back and the rear window leaned foreward for a pleasing flow of the lower top.The rear corners of the door were rounded and the drip rails removed, which changed the looks of the top completely. 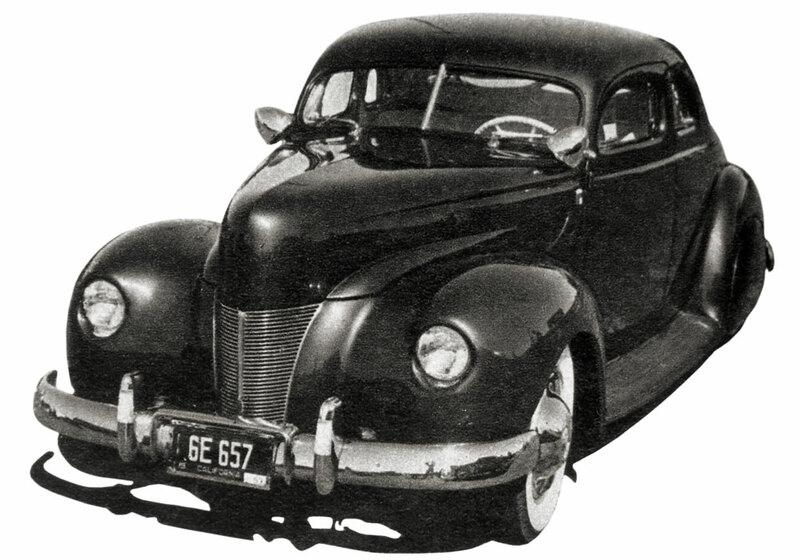 The first version of the Tom Hocker 1940 Ford shows the Cadillac Sombrero hubcaps, and the molded in headlights. 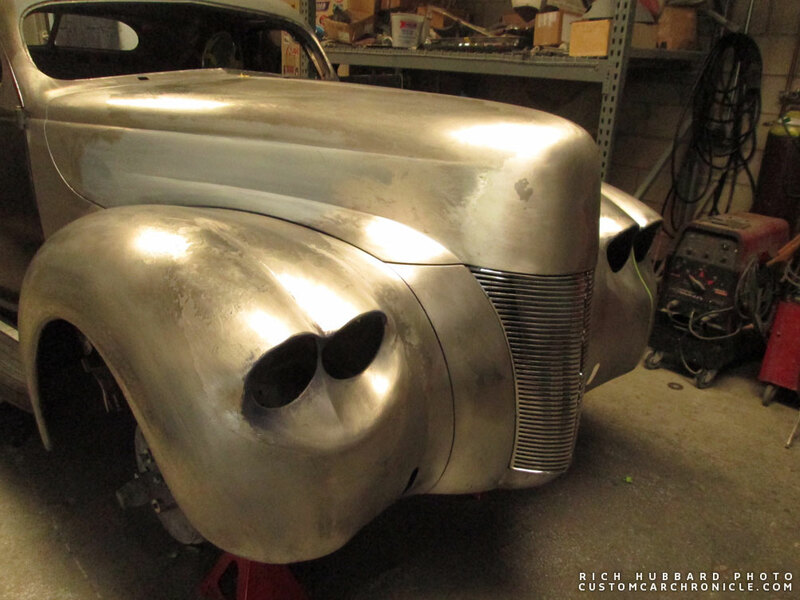 All fenders where molded to the body and at the rear a new gravel pan was molded to the body. The hood was peaked and the side grilles were replaced with solid panels molded to the body. The headlights where molded in and all chrome removed. Narrowed 1949 Pontiac bumpers were used front and rear. At the back the bumper guards were madified to house hand made clear red lucite taillights and the front guards were modified in a similar way to house a set of clear parking lights. 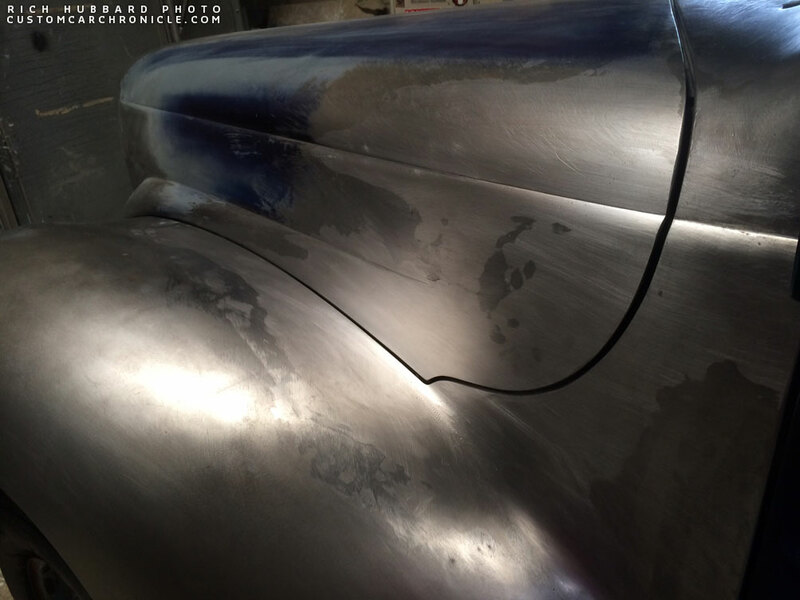 Fender skirts appleton spots and v-butted windshield complete this gorgeous custom. This is an early version of the Tom Hocker 1940 Ford. Originally the car had Cadillac sombrero hubcaps, so this photo was taken a bit later, after Tom had replaced them with 1953 Cadillac units. The car still had its original Fushia Orchid paint in this photo. Around 1953 Tom’s Ford was painted fuchsia orchid and later it was repainted in light metallic blue with lighter scallops. In the later part of the 1950’s Tom wanted to update the Ford with the hit of that time, quad headlights. 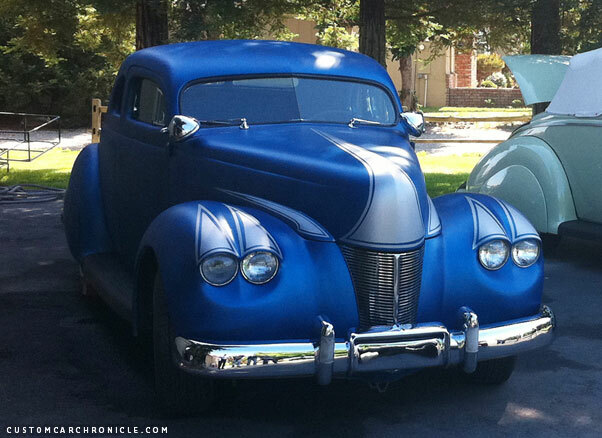 So back to Barris who removed the molded in headlights and replaced them with a set of double molded headlights. The car was once again painted light metallic blue with lighter silver blue scallops. In the 1970’s the car was painted pearl white and later a set of lavender scallops was added. It was like this when it was used in a evening cruising scene in the American Graffiti movie. The Hocker Ford at the 1959 Oakland Roadster show, photo from the Rod Powell Collection. Movie still from American Graffiti with the car in pearl white, new taillights different wheels, no skirts and lavender scallops. 2012, the partly restored Ford was primer painted and put back together for a special event. Ed Hegarty, also owner of the Buddy Ohanesian 1940 Mercury aquired the Ford quite some time ago and planned to have the car completely restored into the last Barris version. 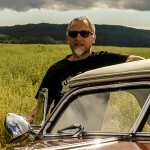 Sadly Ed passed away, and the car passed on to his son. 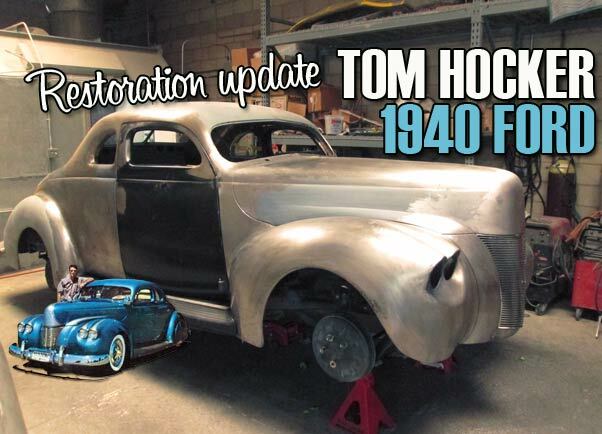 The restoration of the car is still going, and we have just recieved some new updated photos from Rich Hubbard who is completing the restoration on the Tom Hocker Ford. The body is completely metal finished now. And we are looking forward to see some new primer and paint on it… hopefully soon. Stay tuned. Thank you for keeping us updated Rick Hubbard. 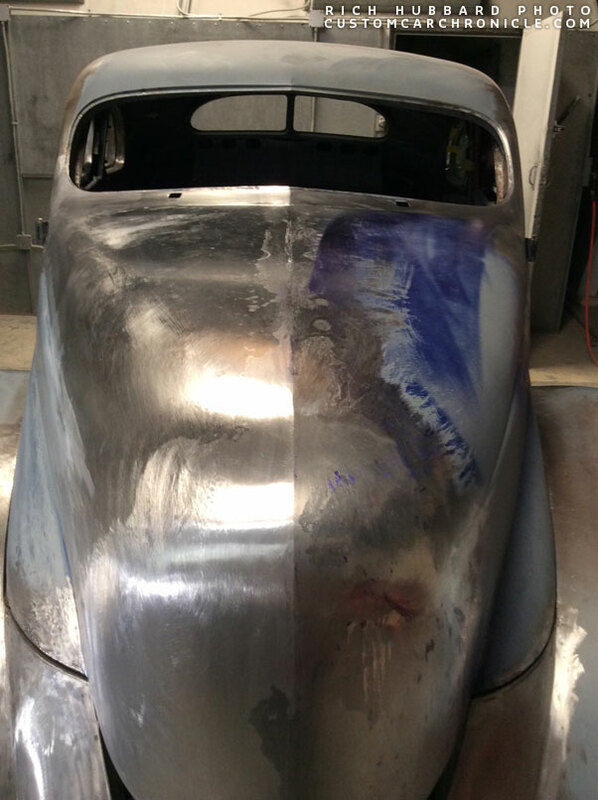 February 2015, this is how the car looks now with all the body work metal finished. As is usually the case, I much prefer the earlier version. Love to see a pic with the sombreros. Scrub Hansen’s looks to be a latter day version of the same car in some ways. I understand all about show points, the quad headlight fad and that stuff, but those heavy eyelid quad headlights don’t help the looks of that car (if any). 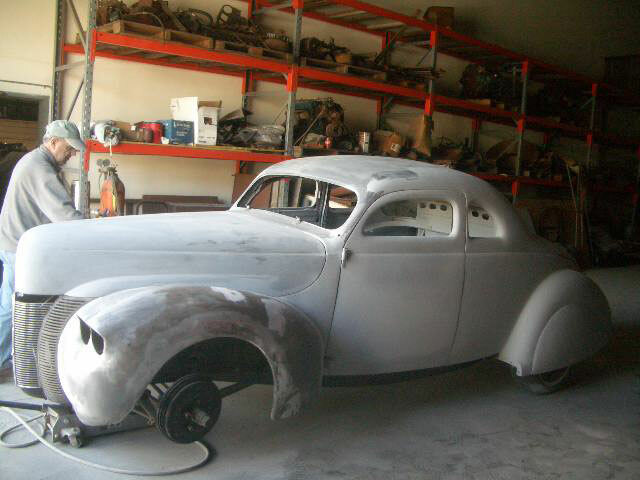 I have added two photos of the very first version of the car with the Sombrero hubcaps Tony. In my eyes the 1940 Ford really benefit from a leaned back windshield, and Scrub’s 1940 Ford has the windshield on the stock angle I think. I also prefer the early version over the later quad headlight version. 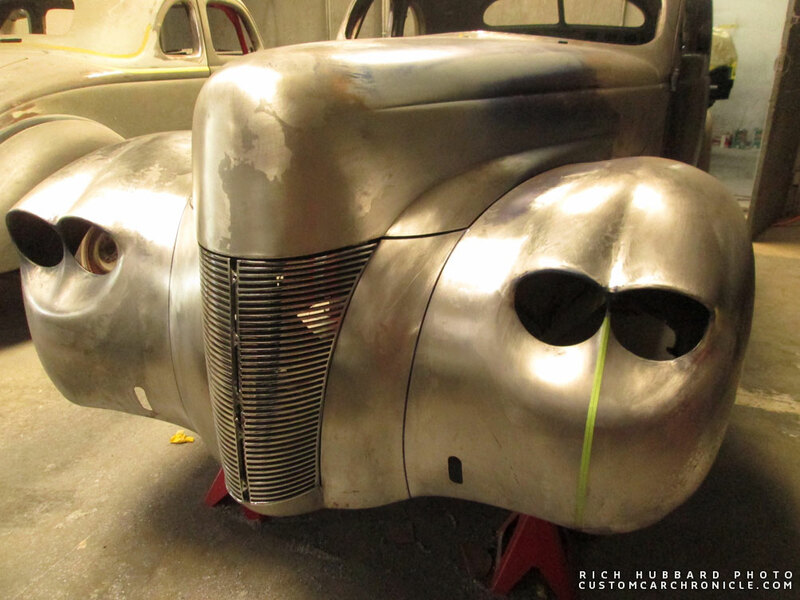 But at the same time I understand that you do not want to removed these original Barris Kustoms created quad headlights in its restoration. Thanks Rik. Good to see a rear shot too. A very nice early custom. 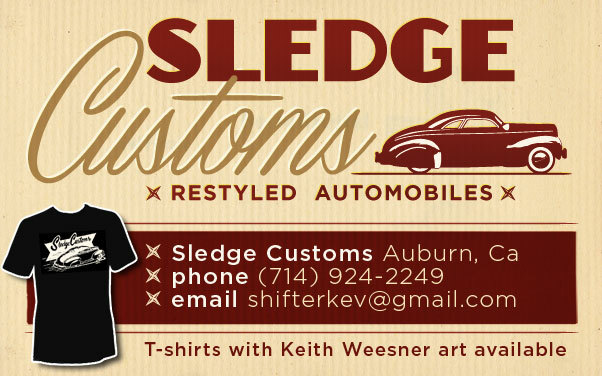 One of my favorites…’39-’40 Ford look good either chopped or unchopped, but this car looks great with a chop and taildragger look more commonly reserved for the ’39-’40 Mercs, especially in the early ’50s or earlier. I think both versions are really cool…the quads capture that interesting time when “dated” kustoms got a few changes to keep up with trends…not all of them looked better afterwards, but this one is neat. Thank you for keeping us posted on the restoration, Rik. Who is doing the work, by the way? Metalwork looks very nice.